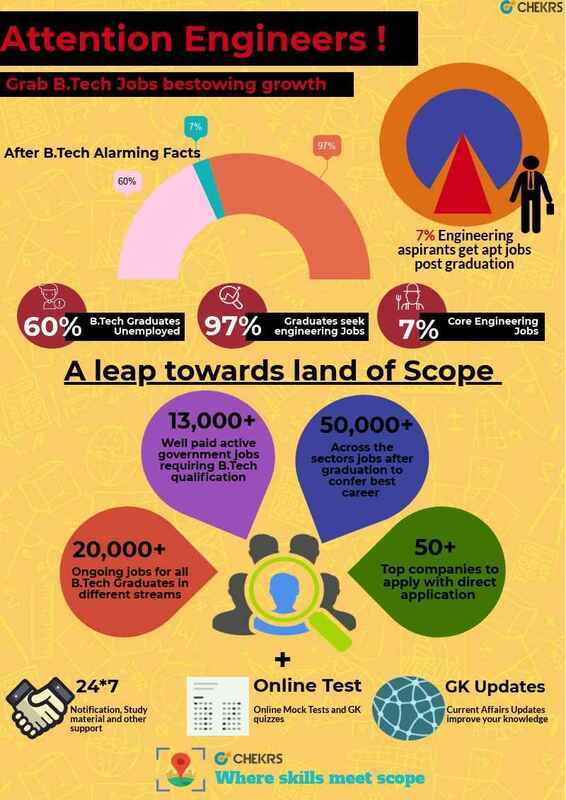 All the Engineering graduates can now build their career with the best opportunity available to them. The Chekrs serves as the one-stop of B.Tech Jobs for Freshers brought from different sources assembled at one place. With the changing times now there are highly paid vacancies in the government sector as well. At the Chekrs you can easily review more than 300 Engineering Govt Jobs that are provided to for the B Tech students. The Govt Jobs for Btech EEE, ECE, CSE range in central and state government jobs for Railway, Manufacturing, Construction, SSC, PSC, etc. You can easily swatch through these reputed B Tech Govt Jobs 2019 notifications with the help of easy search filters being updated every day. Bringing the Jobs for B.Tech Graduates from all top IT companies and other different sectors of construction, electronics, aviation, metallurgical, etc. here you can find the jobs to meet your preference for B.Tech Jobs in Delhi, B.Tech Jobs in Bangalore, B.Tech Jobs in Pune, B.Tech Jobs in Noida, etc. Most importantly, we are focused to give Jobs for BTech Freshers to increase the employment thereby providing the complete details of all Current Jobs for Btech Freshers. If you are also interested in receiving the Latest Jobs for Btech Freshers updates and the Current B Tech Govt Jobs as soon as they are released than subscribe the updates from jobs.chekrs.com. Why Chekrs for B.Tech Jobs in Bangalore, Delhi, Hyderabad? Along with the exposure to the most relevant jobs, Chekrs helps you sail through the complete process of getting the joining letter. You can check out the job requirement, its eligibility, and selection process and how you can apply for them. To enhance the performance in the selection process you are provided the study material comprising of papers and online tests. Latest B.Tech Jobs, Upcoming B.Tech Posts Vacancy, Apply Online B.Tech Degree, Recruitment Notification for B.Tech.